Schwartz & Wade, 9780375870026, 40pp. EMILY JENKINS is the author of the highly successful picture book Five Creatures, which has won numerous awards, including a Boston Globe-Horn Book Honor. She is also the author of the Toys trilogy and numerous other award-winning books for children. Visit her at EmilyJenkins.com/kidsbooks.html. STEPHANIE GRAEGIN's first picture book, Happy Birthday, Bunny! by Liz Garton Scanlon, will publish in January 2013. Graegin received her BFA from the Maryland Institute for Fine Arts and her MFA in printmaking from Pratt. 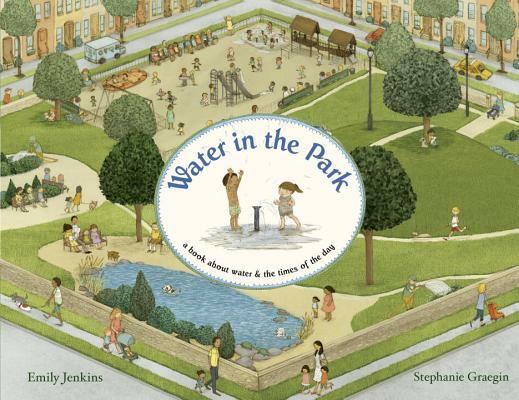 "In addition to being a mesmerizing tale in its own right, the book offers a wide range of possible uses—it’s rich with opportunities for one-on-one seek and find, whether of water or of people, and its immediacy and vividness make it a sneaky alternative for days when weather kills off an actual park visit."